WASHINGTON (CNN) -- In January 2009, President-elect Barack Obama and his family made history, becoming the first African-American first family to move into the White House -- a house with a history of slavery. In fact, the legacy of American presidents owning slaves goes all the way back to George Washington. Twelve American presidents owned slaves and eight of them, starting with Washington, owned slaves while in office. Almost from the very start, slaves were a common sight in the executive mansion. A list of construction workers building the White House in 1795 includes five slaves - named Tom, Peter, Ben, Harry and Daniel -- all put to work as carpenters. 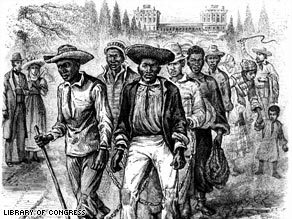 Other slaves worked as masons in the government quarries, cutting the stone for early government buildings, including the White House and U.S. Capitol. According to records kept by the White House Historical Association, slaves often worked seven days a week -- even in the hot and humid Washington summers.